SAVANNAH, Ga., Oct. 6, 2003 – Gulfstream Aerospace, a wholly owned subsidiary of General Dynamics (NYSE: GD), today introduced its newest business jet, the large-cabin, long-range Gulfstream G450. The most technologically advanced business jet in its class, the G450 will be officially unveiled at this year’s National Business Aviation Association’s Annual Meeting and Convention being held Oct. 7-9 in Orlando, Fla. The G450 is an entire aircraft upgrade of an already outstanding business jet – the Gulfstream GIV/GIV-SP/G400, the best-selling business jet in its class, with 500 aircraft built and sold between 1982 and 2002. The GIV entered service in June,1987 and in December 2002, the last GIV was "rolled out" and the manufacturing line was transitioned to produce the Gulfstream G300 and G400. From the exterior, the discerning observer of the G450 will note the repositioning of the main entrance door and the slightly longer fuselage than that of the GIV/G400. Inside the aircraft, all of the systems in the G450 have been modified to improve safety, passenger comfort and pilot efficiencies. The G450 outperforms the G400 with a 250-nautical mile additional range capability and improved hot-day and high-elevation takeoff performance. G450 owners, operators, pilots and passengers familiar with the G400 will immediately see and feel the difference provided by the extra 12 inches in the fuselage and changes in the interior arrangement. Inside the cockpit, the flight crew will discover a working environment designed for safety and efficiency with the state-of-the-art PlaneView™ cockpit, a fully integrated flight deck that is more advanced than anything found on competing aircraft. In addition the crew will enjoy 30 percent more work space. With Gulfstream’s signature Cursor Control Device and large, easy-to-read displays, pilots will use point-and-click technology to access the status of onboard systems or update flight information. Those in the cabin will experience a significant increase in the level of comfort, as a result of improved temperature control and cabin pressure systems. 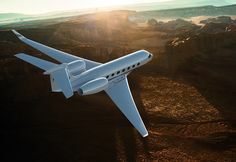 "The G450 incorporates the most advanced avionics, cockpit displays, aircraft systems, aerodynamic enhancements and flight safety features, and retains the aesthetic design and signature windows that have set Gulfstream aircraft apart from its competition," said Bryan Moss, president, Gulfstream. "Every aspect of the new Gulfstream G450 was designed for safety, performance, reliability and comfort." Gulfstream expects to begin G450 customer deliveries during the second quarter of 2005. Based on the aircraft development schedule, Gulfstream expects to receive Federal Aviation Administration (FAA) Type Certification in the third quarter of 2004 and validation by the European Aviation Safety Authority in the fourth quarter of 2004. For the past two years, Gulfstream has been developing two business jets concurrently: the G450 and the large-cabin, ultra-long-range G550, which was certified by the FAA in August this year. Following the creation of a G550 prototype in 2001, Gulfstream immediately began work on the G450, dubbed "GIV-X" at the time. The first G450 test aircraft completed its first flight on April 30th. Since then, three additional aircraft have entered the flight test program. Together, the four aircraft have completed 58 test flights and have flown more than 150 hours with G450 test pilots and engineers testing the new onboard systems and the PlaneView flight deck. All major system development testing has been successfully completed and FAA Certification tests started. Initially developed for the G550 / G500, the PlaneView cockpit was chosen for the G450 because of its distinction as the most advanced flight deck available in commercial aviation today. Developed by Gulfstream, PlaneView is the product of years of experience in developing cutting-edge technology for improved pilot situational awareness and safety. An integrated avionics suite, PlaneView features four large 14-inch liquid crystal displays in landscape format – the first cockpit to incorporate this type of display. The unique implementation of Honeywell’s Primus Epic® architecture and display system provides substantially more display area than previous six-display designs while reducing the overall volume and weight of the equipment. The PlaneView flight deck, which incorporates elegant human interface design, is a clean, flexible and concise system of flight, navigation and system displays. The pilot’s scan of the expansive display area finds flight and navigation data in logical and familiar locations, resulting in increased situational awareness and reduced workload. PlaneView includes the first fully synchronous triple Flight Management System (FMS). Using the Gulfstream signature Cursor Control Device (CCD), another first of its kind, pilots can integrate the FMS and the display map, producing true graphical flight planning. The integrated navigation map displays the flight plan along with terrain, airways, airports, navigational aids and radar data. The CCD also provides the natural interface for display selection, configuration, checklist and other functions. For pilots who prefer direct interface with flight controls, they can opt for traditional dedicated controls that have been retained. In addition to impressive head-down displays, PlaneView incorporates the latest in Head-Up Display (HUD) technology with the next generation Visual Guidance System. The information and guidance cues provided by the VGS allow the pilot to easily control the aircraft without the need to look down at the instrument panel. Not just an additional primary flight display, VGS displays images from the Gulfstream Enhanced Vision System (EVS), the first of its kind to receive FAA certification, and is standard equipment on the G450. The advanced infrared imaging technology of the EVS is specially tuned to the frequency of runway lights for approach, but also provides rendering of the surrounding environment. With EVS, pilots have a clear picture of runway markings, taxiways and the landscape in poor weather and at night for greater situational awareness, reduced minimums, and prevention of Controlled Flight Into Terrain (CFIT). The EVS has been recognized with multiple aviation industry awards for its dramatic safety advancement. With the G450, Gulfstream has made a reliable aircraft even more reliable. While it’s hard to beat the GIV’s 99.7 percent dispatch reliability rating, Gulfstream has every intention of doing so by addressing and upgrading those systems that historically have required the most attention in the service hangar. The G400 Electrical Power System is replaced with a more capable and reliable system proven on the GV/G550. Two 40kVA Integrated Drive Generators and a 40 kVA APU Generator provide a significant improvement in electrical power capacity, no-break power transfer capability, and added redundancy for safe, reliable operation. A new version of the Honeywell 36-150 APU provides improved reliability for engine starting, better performance for cabin temperature control, and improved high altitude electrical power capacity. The 36-150 is ramp-friendly, with exterior noise levels greatly reduced from the G400. The new dual-pack Environmental Control System, based on the G550 air cycle machines and 3-zone digital cabin temperature control provides greater heating and cooling capacity for crew and passenger comfort. A new G550 style passive door seal and dual digital cabin pressurization system provides added redundancy and safety, while reducing the maximum cabin altitude from 6500 ft to 6000 ft for added passenger comfort. The new digital Engine Vibration Monitor card is integrated into the Primus Epic Modular Avionics Unit, providing additional automated engine balancing features, and interface with the PlaneView Maintenance Computer and Displays. Rolls-Royce has developed an improved Tay engine, designated the Tay 611-8C, which produces 13,850 pounds of thrust and was certified in December 2002 by the LBA. It is manufactured by Rolls-Royce Deutschland in Germany. This engine features a Full Authority Digital Engine Control (FADEC), improved larger diameter fan, modified high pressure turbine and new bypass/core mixer. These improvements have resulted in reduced fuel burn, increased operating margins, increased thrust for improved takeoff and climb performance, and extension of maintenance intervals to 6,000 hours midlife and 12,000 hours for full overhaul. The Tay 611-8C engine, in combination with the new composite, single-pivot, fixed-nozzle (G550 style) thrust-reverser system from Nordam, and a series of aerodynamic improvements, extends the G450 range to 4,350 nautical miles at .80 Mach. That’s Dallas to Paris on a hot day with eight passengers aboard. Additionally, the G450 can climb to an initial cruise altitude of 41,000 feet in just 23 minutes and take off from a 5,450-foot runway with a full load of fuel and eight passengers onboard. With the PlaneView flight deck came smaller avionics components that took up less space. One foot longer than the GIV/G400/G300 cockpit, the G450 cockpit has the increased comfort and usable workspace of the G550/G500 cockpit. Additionally, Gulfstream relocated avionics equipment forward of the cabin door to improve access to the cabin and create more usable space for passengers. With three distinct living areas, the G450 provides seating for up to 14 passengers and comes fully appointed. G450 passengers, especially those on long intercontinental flights, will appreciate the relaxing cabin atmosphere with three temperature zones, ample light streaming through 12 heated signature oval windows and 100 percent fresh air. The G450 shares many of the same aircraft systems with Gulfstream’s ultra-long-range G550 cockpit displays, ECS packs, pressurization system, electrical power, ECS, nose landing gear, nose wheel steering, oxygen and fire extinguishing systems – just to name a few. Because these common systems are made up of identical parts, a corporation operating a fleet that includes both the G450 and G550 aircraft can reduce the number of spare parts in its inventory, and thus reduce its operational and maintenance training costs. Additionally, the G450 pilot type rating is expected to be the same as the G550 pilot type rating with a minimal amount of additional training on the different engine models. Gulfstream’s industry-exclusive Airborne Product Support™ is available to G450 customers. Launched in May 2002, Airborne Product Support features a dedicated mid-cabin, high-speed Gulfstream G100™ jet that can deliver flight-essential parts and/or technicians to warrantied Gulfstream customers in North America and the Caribbean. Gulfstream Aerospace Corporation, a wholly owned subsidiary of General Dynamics (NYSE: GD), designs, develops, manufactures, markets, services and supports the world’s most technologically advanced business jet aircraft. Gulfstream has produced more than 1,400 aircraft for customers around the world since 1958. To meet the diverse transportation needs of the future, Gulfstream offers a comprehensive fleet of aircraft, comprising the mid-cabin, high-speed Gulfstream G100™; the wide-cabin, high-speed Gulfstream G150™; the large-cabin, mid-range Gulfstream G200™; the large-cabin, mid-range Gulfstream G300™; the large-cabin, long-range Gulfstream G400™; the large-cabin, long-range G450, the large-cabin, ultra-long-range Gulfstream G500™ and the large-cabin, ultra-long-range Gulfstream G550™. Gulfstream also offers aircraft ownership services via Gulfstream Financial Services Division and Gulfstream Pre-Owned Aircraft Sales®. The company employs more than 6,750 people at seven major locations. We invite you to visit our Web site for more information and photos of Gulfstream aircraft at www.gulfstream.com. General Dynamics, headquartered in Falls Church, Virginia, employs approximately 64,600 people worldwide and estimates 2003 revenues of $15.5 billion. The company has leading market positions in mission-critical information systems and technologies, land and amphibious combat systems, shipbuilding and marine systems, and business aviation. More information about the company can be found on the World Wide Web at www.generaldynamics.com.